I'm using Geographicraft and RTG and BOP on 1.10.2, and can't get the world I want. I have one specific BOP biome (Lavender) set to an incidence of 23, while every other biome, BOP and Vanilla, is set to 10 or less. But I keep getting worlds with almost no Lavender. What do I have set up wrong? Am I misunderstanding incidence, and an incidence of 5 means more of that biome in the world than an incidence of 20? Edit-To be clear, I want a world with a TON of Lavender biome, and most of the other biomes around as well. Ideally, my world would be like 50% Lavender and all the other biomes would share the other half of the world about equally, so I'd see like, lavender, plains, lavender, jungle, lavender, lush desert, etc. Does this support Thaumcraft 6 (1.12.2) currently? Normally Thaumcraft adds a couple biomes of its own (Magical Forest and Eerie/Taint). 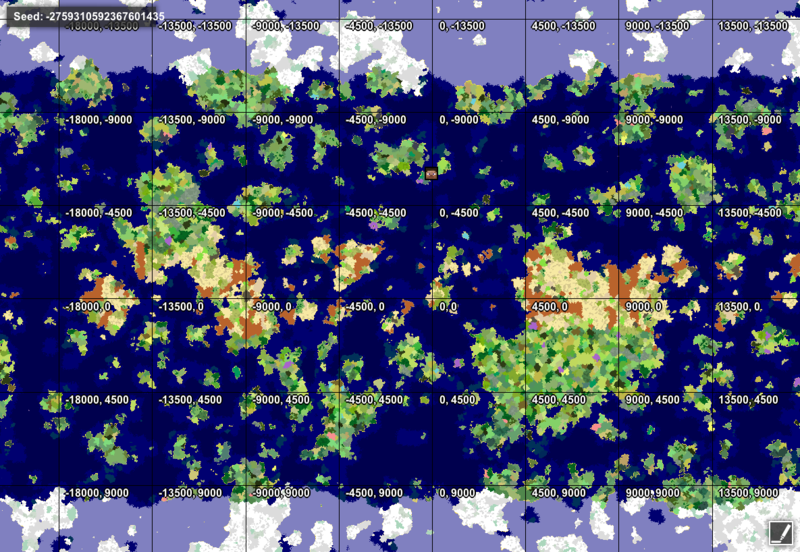 And some of the biomes in BoP have changed recently (additions and removals). Not sure if we can edit configs ourselves to have these reflected or not, can anyone confirm please? You are not misunderstanding it. Generally ive found that if you want to see more of a biome you need its incidence above 30. Try 36 and see what happens. As a double check - set it 90 and test it - if its still not appearing then something is definitely wrong. The other thing to check is that your biome ID's are not conflicting and there isn't another mod using the same biome number as BOPs Lavender Fields and overwriting it. I'll give that a shot, thanks! I don't think the IDs are conflicting cos I am finding *some* of the Lavender Fields, just nowhere near as much as I want. I am wanting to use this with the Climate Control to Mystcraft mod by Zen410. My question: Is there a way to disable this for regular worldgen while still having it available for the other mod to call so as to affect the Mystcraft Ages, or is it an all or nothing type of thing? I'm having a steep learning curve using this program. What I'm trying to do, is create something like the Carribean. A tropic paradise ocean for a pirates adventure. So far things seem okay. But, I am running into one problem. I think the solution would be if there is a way for me to designate my own custom climate group called "Tropics." And have a config option so that I can make the instances of "Tropics" to be higher. The question was asked before about custom climates. But, how about a new one called tropics that would work with BoP biomes? Is there a way to get my derpy little islands back out in deep ocean? The derpy island config option does not appear to work. I basically defined all the biomes I wanted as warm climates then put all the rest into either hot or cool. I also used climate bands and I was able to create a tropical environment for adventures. I still don't know about the derpy islands. I did discover something interesting. The tropical island biome from BoP is defined by default as a deep_ocean biome. I also noticed in the geographicraft config file a place where the instances of ocean and deep_ocean are both given the number of 100. That got me thinking that I could alter the number of times the tropical island biome would appear by given it an instance weight of 100. Sure enough I got alot of them spawning. But, something else interesting happened. It seems that this mod still makes huge oceans. When I make more tropical islands spawn the big ocean appears to have been pushed back rather than chopped up or dotted with tropical islands. Is this correct? Could I get some feedback on this? Also, for me the mangrove biome from BoP seems to be treated as if it were another swamp like biome. I found it more pleasing to make it its own biome spawning in the ocean. I changed the setting from tropical_island=warm (or whatever) to setting it to climate = ocean. What this did, is to make small islands out of mangrove collections. The only weirdish thing is that they also get a beach. For me that's not too too bad because in real life mangroves work like giant sand nets and tend to collect enough to make small islands. Would you mind explaining what the world gen settings do (Height, Amplitude, noise, etc)? I've been messing around with the settings to try and get a more epic terrain, similar to that of RTG or amplified and I am getting INSANE results. Hey Zeno, do you think you could add in compatibility for Traverse, it seems to generate one of their cold biomes into every climate zone. You asked this awhile ago, so you might've found the answer but from the testing I've done GC does not currently work with Thaumcraft 6. No evidence of Magical Forest anywhere, I even checked using Amidst for Forge. When I disable GC Magical Forest generates again. Please, explain, how to create the same map as on the screenshot? Many times I changed almost all settings in Config files but all worlds were monotonous and I cant catch the difference between them. which all seem to involve both ClimateControl and Reika's mods in some way. He's had ClimateControl running on his development servers without this problem, so I don't know, maybe there's a third party at work but I can't find out what the cause of this problem might be. The two might look very similar but they involve different functions further down. One is triggered by a "place light" event from ChromatiCraft's cave lighter and the other apparently by a fire spread event, but they both involve functions from Reika's CaveControl and ClimateControl. I'd like some help in debugging this, please! I hope Zeno comes back for an update in 1.14. This mod seems like it'd be really cool for my server, but I don't wanna have to undo my updates for one mod when we updated because we wanted the new features. Did you mean Amidst for Forge? What I'm hoping to use Climate Control for is to cause all of the "evil" biomes in my pack (abyssalcraft, thaumcraft tainted lands, BOP ominous woods, etc) to generate on their own island, independent from other biomes. How (or if) could I accomplish this with climate control? Update: I've kind-of accomplished this by setting all "evil" biomes to snowy, all snowy biomes to cool, and all cool biomes to warm, but this still is far from perfect.